What's a girl to do when's it way too hot to venture outside all weekend. This girl set to make some pina coladas. Not the real McCoy with rum, mind you! This one is a nice girl version. I chilled 100 ml of coconut milk and 200 ml of sweetened pineapple juice in the freezer for half an hour, then blended them together until frothy. Some recipes say to add a scoop of vanilla icecream and I guess it would make your drink creamier and colder, but freezing did the trick well enough for me. 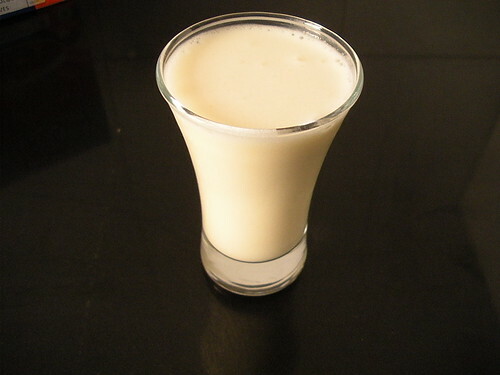 Pina Colada is my first entry for Srivalli's Thanda Mela. With sun blazing the next two months, you got plenty more coming. perfect for the weathe rhere,.. Perfect summer cooler!! Even I prefer to semi-freeze my cool drink and then blend to make a creamy cooler sans the calories! !